BANTING: Police believe that Datuk Sosilawati Lawiya and three others were burnt at a farm and ashes dispersed at sea near Morib but have yet to identify the remains conclusively. Eight suspects have been arrested in connection with their disappearance. CID Director Datuk Seri Bakri Zinin will be giving a press conference soon to give details. Sosilawati went missing on Aug 30 along with her driver Kamarudin Shansudin, 44, her lawyer Ahmad Kamil Karim, 32, and her financial adviser Noorhisham Mohammad, 38. Sosilawati's siblings have gone to Banting to help police with the DNA confirmation of her death. Bernama reports that the police forensic team is combing the farm area. Police had also blocked access to the Gadong Farm in Jalan Gadong, Tanjong Sepat, near here from last night and have not allowed the media access to the area, Bernama reported. I just hope everyone is safe, some more it is the holy Raya festive season now. 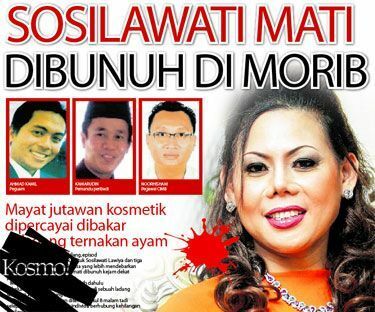 Sigh, sad to hear the murdered news these days about the death of Datuk Sosilawati Lawiya. Even sadder when people start blaming Indian because the suspect is an Indian guy..... I have a question about this, do you guys google #sosilawati because she is a millionaire? Or you care about what's happening to Malaysian~? If you want to have latest updated news, try follow Twitter's mentions "#sosilawati". You can subscribe to TianChad @ 永遇乐 or follow @TianChad on Twitter for future blog post update. The Golden rule: don't trust anyone. Anyone can be shady.